Boston born striker Mickey (Michael) Nuttell started his career with Peterborough United in 1985. During his time at the Posh, he went out on loan to Crewe Alexandra and Carlisle United, before being sold to Cheltenham Town for £8000. in January 1989. Wycombe Wanderers paid £6000 for his services in September 1990, before he joined Boston United in 1991 for £14,000 before joining Kettering Town, then Dagenham & Redbridge, where scouts from Tottenham Hotspur took an interest. He moved to Nene Park in July 1993, for a £10,000 fee and was top scorer in the 1993 / 1994 season with 29 league goals as the Diamonds won the Beazer Homes Midland Division .He appeared in 40 of the 42 league games. He also played in the Beazer Homes Premier Division for the Diamonds, and maintained an excellent goalscoring record throughout. 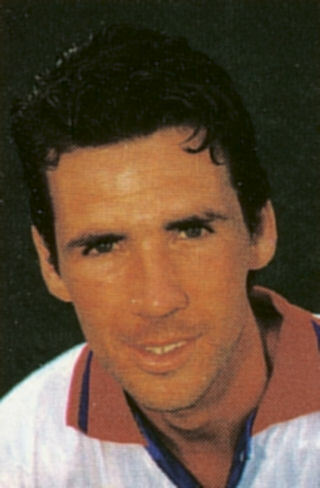 He made only a dozen or so appearances in the 1995/1996 season, mainly off the bench, and went out on loan to his hometown club of Boston United in January 1996. He was released in March 1996 to join Burton Albion. 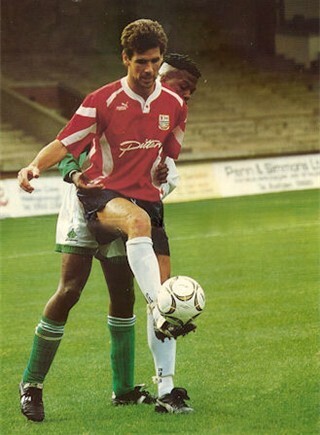 After completing the season with the Brewers, he joined Kettering Town, but was released by the Poppies manager Peter Morris in the summer of 1998 and joined Kings Lynn. The following year, he was back for a third spell at Boston United, before a spells with Wisbech Town in July 2001, Bedford Town and Holbeach United. He joined Spalding United in the summer of 2003 and it was while he was with Spalding that his wife was killed in a car accident in May 2004. He later spent two seasons with Bourne Town, before joining Boston Town in the summer of 2006. He needed a hernia operation and his appearances were limited. He went back for a 4th spell at Boston United in February 2008. Mickey returned to Boston Town again, an was still making appearances at the age of 43, and combining his appearances, with coaching the Under16 / 18’s at Boston United. He is still linked to the Boston area, but has hung up his boots.